Here we see a year passing like nothing in the life of Darrell Evans. In the earlier photo, at our left, Evans is apparently in San Francisco, wearing home whites and long sleeves, perhaps to combat the infamously raw temperatures at Candlestick. He seems pensive, maybe even slightly displeased. Maybe the Pittsburgh Pirates catcher, possibly Ed Ott, has just muttered something troubling through his mask to Evans. All hopes fade. All beauty crumbles. All roads lead to the boneyard. The second photo seems to be in Los Angeles, judging from Evans’ dark uniform and the backwards cap on the catcher. (It seems indeed to be a cap and not a helmet, which makes me think this is not the Dodgers’ regular catcher, Steve Yeager, though I am basing this assumption solely on the hazy recollection that Yeager was once nearly killed by a broken bat flying into his neck and responded by inventing the first neck guard, which I assume was accompanied in the newly sobered and extra cautious nephew of Chuck Yeager’s armor by a sturdy helmet. My gut feeling, without checking any rosters of the time, is that the catcher pictured here is Dodgers backup Rick Dempsey Johnny Oates, who I see in my mind’s eye catching with a turned-around cap and not a helmet and who as far as I know avoided getting brained by any balls to that soft cloth cap as well as any jagged bat shards to the neck but who instead eventually died before his time anyway, of cancer.) In this slightly more recent photo Evans trains his pensive, faintly perturbed gaze straight at the viewer. He has let another pitch go by. Maybe it has been called a strike. But maybe not. Maybe it has been called a ball and Darrell Evans is on the brink of yet another of his many featureless, unmemorable walks. Maybe he has grown weary of the routine of tossing his bat toward the dugout and loping down to first to stand there until Johnny Lemaster or Terry Whitfield pops out to end the inning. As for me, I am finally home after most of a month spent traveling. I am back in my life, the one that would be depicted on a card if trading cards showing people like me existed. I am working as a proofreader. Same as last year and the year before that and the year before that. 1. Welcome back. You’ve been missed. 2. I think you’re getting your Dodgers backup catchers mixed up. Johnny Oates passed away from cancer. Dempsey is still alive and broadcasting O’s games/studio shows. 3. 2: Yes, right you are! I’m an idiot! Apologies to anyone who thought for a second that Rick Dempsey was no more. 4. … The background in that second card is definitely not Dodger Stadium; that, I know. It actually looks like Candlestick in that background, and that the Giants that day decided to wear their black alternate jerseys at home. 5. Could the Dodgers catcher possibly be Joe Ferguson? 6. 5: According to an earlier photo–a Bobby Murcer card that Ferguson oddly dominates (http://cardboardgods.baseballtoaster.com/archives/609892.html)–Ferguson had already made the switch to wearing a helmet while catching. I’m thinking it’s eaither Oates or old-timer Jerry Grote, who played sparingly for the Dodgers during the season in question. But the only thing I can say for sure is that it’s not Rick Dempsey. 7. If we assume that is Dodger Stadium and 1978, we can eliminate Jerry Grote. He only caught at Dodger Stadium against the Giants once that year. Grote entered the game in the top of the seventh on August 10. Evans didn’t bat that inning and then was replaced in the bottom of the inning. 8. … I’m thinking May 28, 1978 at Candlestick. Day game, Oates was behind the plate for L.A., and the Giants likely wore their alternates on a Sunday. 10. This type of stuff is right up my alley, good job every one on the guesses. I can’t say for certain when it was taken, but I say Candlestick is the place- I mean, check out the background, it is identical, except in the 1979 card, the background is washed out, due to the sunlight. There is a pole or something, sticking up behind the fence, and everything else about the background is the same. Candlestick, no doubt. Now, I agree, being 41, and remembering plenty about the players then, Ferguson wore the helmet catching, so did Yeager, no question. That leaves Oates and Grote. Now, I went so far to look at hair color from their old cards(yes, I do have a life outside of commenting on cards on websites), and honestly, I think I lean more towards Grote, for this reason. He always kept the brim of his hat in that cocked up position when he caught. I remember this, because I always thought it was unique, remember, this was in the days before they all wore helmets. Cliff Johnson, remember him, when he played and actually caught a few games for the Yankees, did the same thing. So, my money is on Jerry Grote on Sat, 5/27/78, the only day game that he caught in Candlestick vs. SF, that Evans was also in the lineup. Also, remember, the alternate jersey thing was not so much a Sunday thing then, it was often choosen by someone else, a club PR guy, and it could be any day-ala the Pirates and their multiple uniforms of that era. Anyway, good that the Man Josh is back, this stuff makes our little world a bit more fun. What is this “life outside of commenting on cards on websites” you speak of? 12. I think that’s Jerry Grote. I once wrote an autograph request letter to Darrell Evans, not at all unlike the hundreds I’ve written to other players. The thing that makes Evans unique in my experience is he wrote back with a full-page letter that answered my question about the toughest pitcher he ever faced. He said John Candelaria. Told me that after he got lucky (his words) and hit his only homer off him, that Candelaria would knock him down everytime up. Who knows? Maybe he looks pensive on that ’78 card because “The Candy Man” was out there taking aim at him. 13. I looked up his stats against Candy. Turns out his recollection was slightly off. He actually hit two homers off Candelaria. Other than that, it wasn’t pretty. He only hit .154 with 19 strikeouts in 65 at-bats against him. I can see why he told me he thought he was the closest thing to Randy Johnson he ever faced. 14. 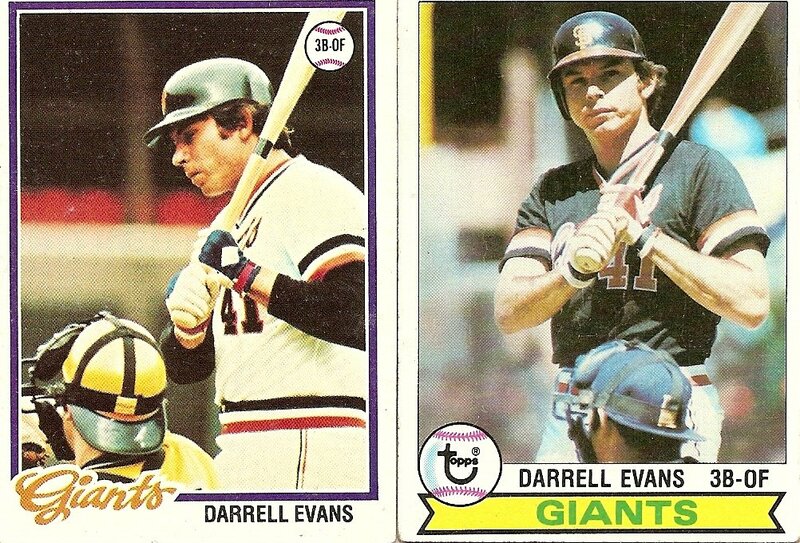 I remember the year Evans hit 40+ home runs for the Giants. It was absolutely amazing because he just COULD NOT be pitched to. I remember pitchers throwing waste pitches down and in, just a couple of inches off the dirt, nearly at his foot, and him golfing the ball deep down the line for a no-doubter. The only thing comparable I’ve seen is Barry Bonds, but Barry is patient, waiting for something near the zone before murdering it, but he’s not much of a bad ball hitter. Vlad Guerrero is probably pretty close, only he does it year after year. Evans had only the one miraculous season where he could not be stopped. Not to say that he didn’t have other good years. 15. I just don’t get the fascination the Sabermetrics people have with Darrell Evans. Even with the new way of looking at players, he doesn’t seem as good as the Saber people say. Blyleven and Bobby Grich, I can see, Darrell Evans seems to be a bit of a stretch, though.